I love this time of year, seeing all the beautiful flowers and the beautiful sky makes me so thankful for our Lord, for all that he gives us to enjoy day in and day out. We have so many new people that are posting here it's nice to meet all of you. If this is your first time to this blog you can go HERE and read the guide lines, and we hope that you share your thoughts and prayers with us. This is a beautiful picture and wonderful, true statements, Ginger! Thank you and Charlotte so much for Spiritual Sundays! Thank you Ginger. This is beautiful! Have a wonderful weekend. My thoughts exactly, Ginger, as I drove past azalea bushes in bloom today. Oh, how He loves us. Blessings and so beautifully springy Ginger...I'm thankful also for so much beauty! Thanks for inspiring us with this sweet picture and post! 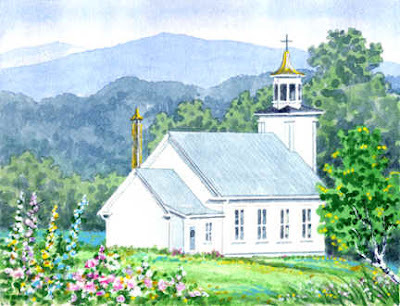 Ginger, I love the picture of the little church. It reminds me of a little country church I once attended. Happy Sunday to everyone! May God bless you all richly and grant your hearts' desires as He wills for each of us. Be strong in the Lord's mighty power! Thank you sisters Charlotte and Ginger for hosting this special place. Oh what a bright and beautiful picture ~ Springtime!! ANNE- If you are reading this, please repost. I can't get the link to your blog to work. Does anyone know her URL? If so, please post in the comment section so we can all pay her a visit! A beautiful picture, and post! I am enjoying all the beautiful flowers and trees in my area. This is my first time to participate in Spiritual Sundays. Thank you for hosting it! I'm looking forward to visiting everyone. Have a lovely Sunday! Love the little church scene and look forward to meeting some new friends. This is a wonderful site. And God created the world and said, "Behold it is very good." Thank you for a welcome into the family of God. Oh what a sweet little picture of the church in spring time. I feel the same way in the spring. It's like a renewal of the hope that we all have in Jesus. I am thankful for Spring, too. The picture is beautiful . Thanks so much to you & Charlotte for hosting SS. I forgot that I had a post scheduled for Spiritual Sunday on my regular blog Amazing Grace so I added it today since it posted with SS. It even surprised me! I still have a few prescheduled there and have almost forgotten except sweet Denise commented so that brought me to look! Many of you have already visited The Power of Your Love, so don't feel you need to again... although it is a really wonderful one too! Thank you again Ginger and Charlotte for Spiritual Sunday! Today, it is overcast, yet warm here in the mountians of eastern Oregon. Yet, today, it is beautiful, peaceful, and most of all , surrounded by the Presence of my God, as He comes to fill my spirit with a song of Hope for a family whose 2 loved ones were in a very serious car accident yesterday. My song of poetry that I received from the Lord has brought me, also, to a place of Hope as Jesus Christ reminds me that in every stormy sea, physical, spiritual or emotional, He is always faithful to bring His presence, and comfort .. We have an AWESOME God, and makes things new and alive every day..
Hello, Just to let you know i now follow your Blog as Faith Hope Love Saves.